Dive under the surface of Acapulco to experience everyday life in this Mexican city on very complete Excursion that will drive you through the most interesting places in town and also in a walking tour lead by a local guide. Visit the city market, the downtown area, a piñata workshop, the cathedral, a typical Mexican bakery, a popsicle factory and more to learn why Acapulco is not just a resort town. Hotel pickup and drop-off, guide, entrance fees, bottled water, and snacks included. After pickup at 9am, begin exploring everyday Acapulco with your guide including visits to a local bakery, the downtown area, the main square or zocalo, and Acapulco´s cathedral. At a popsicle factory learn how they make paletas in so many different flavors. 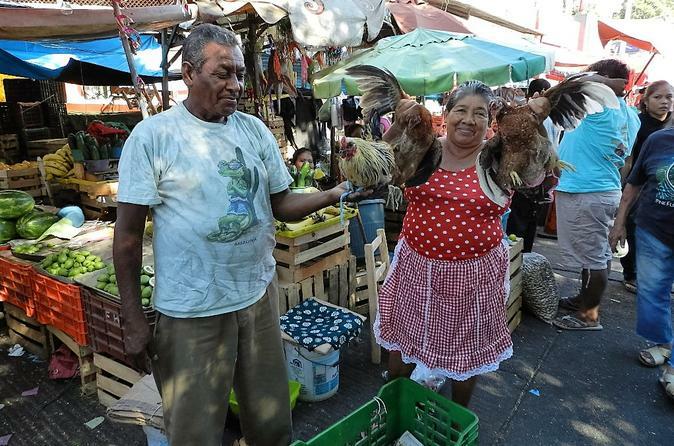 Next, visit a piñata workshop, then go to the Witch Doctor and Sorcerer section of the Municipal Market to find out how natural elements are still used in medicine and rituals. When in a PRIVATE OPTION You may also go do a baby turtle release or we may include any other place you wish. After the tour, lunch is available at La Cabaña restaurant on Caleta Beach (lunch not included) before returning to your hotel or the cruise ship terminal.